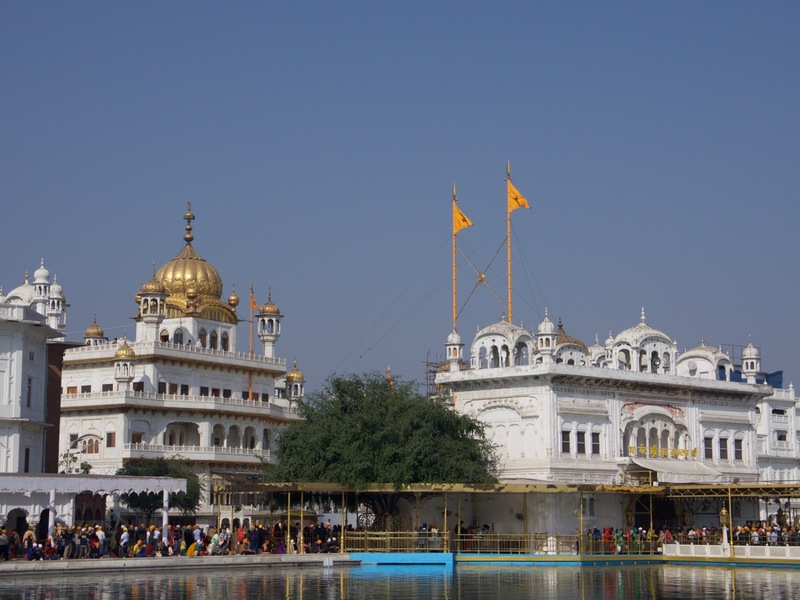 The day after we went to the Wagah border ceremony was December 18, and we decided to go see the Golden Temple. If you read my last post, you’ll remember that Amritsar was a pretty bloody place around the time of partition in 1947. 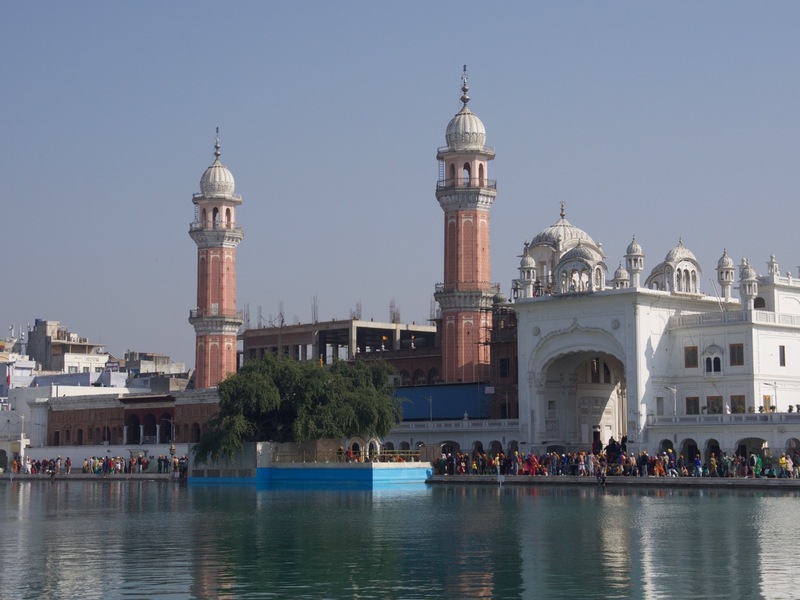 Once the vast majority of the Muslims were relocated across the border into Pakistan, it left Sikhism as the dominant religion of the Indian state of Punjab. And the Golden Temple is their holiest place. 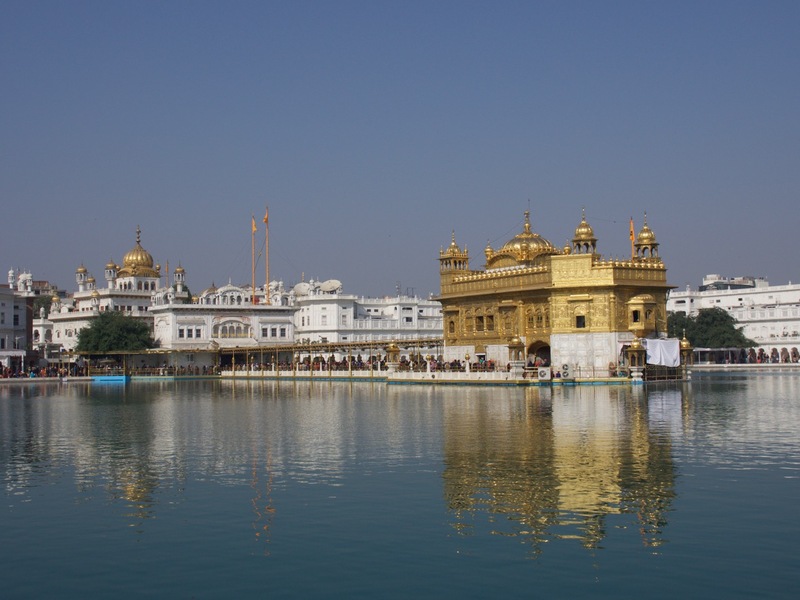 I didn’t know much about Sikhism before traveling to India, and learning that we were in sort of the “Mecca” of Sikhs was a bit of a surprise for me. You can read about the religion and the people on your own; I’ll just say I’ve been impressed with what I’ve read and seen. For one thing, the religion has equality of the sexes built in as a fundamental principal, unlike Hindusim or any of the Abrahamic religions (Judaism, Christianity, and Islam). For another thing, Sikh temples are open 24/7 to any visitor of any religion, and they will feed anyone who comes and asks for food. The guy at the front desk of our hotel recommended that we hire a rickshaw pusher associated with the hotel. In essence, the story was this: He’s an old man, but he can take you to the Golden Temple and nearby sites as you want. And he is very knowledgeable. You can pay him 200 rupees for the ride, and if you feel his services as a guide are good it you can pay him extra for that. So we agreed, and waited in the lobby for the guy to show up. He introduced himself and we climbed aboard. His rickshaw was really wobbly, and Beth in particular was concerned the thing might just fall apart right there in the street with motorcycle and car traffic buzzing all around us. We had to get out and help him push up hills, but other than that he was able to pedal us around just fine. He took us to the Golden Temple first, gave us a basic introduction of how to get in and what to do, and then said he’d wait by his rickshaw out in the street. We’d been inside a gurdwara (Sikh temple) once before, in Old Delhi, so we knew the drill. Everyone must cover their heads, and a hat isn’t good enough. Beth already had a scarf over her head, and I borrowed one from the pile at the entrance. The Sikhs offer scarves for men to borrow when they don’t bring their own, sort of like how Jews sometimes offer a kippah to a guest who forgets his at a bris. Also, everyone takes their shoes off. The Sikhs provide an attended “coat check” type facility for shoes, so you turn your shoes over and they give you a claim check. One extra benefit: If you wear black shoes, they’ll also polish your shoes for you while you’re inside, for free. But I had white New Balance athletic shoes on which can’t really be polished, so I didn’t get that service. On the way in to the temple, there are ample hand-washing stations, and everyone steps through a trough of clean water to clean their bare feet. I noticed something very nice about this, the holiest of temples. 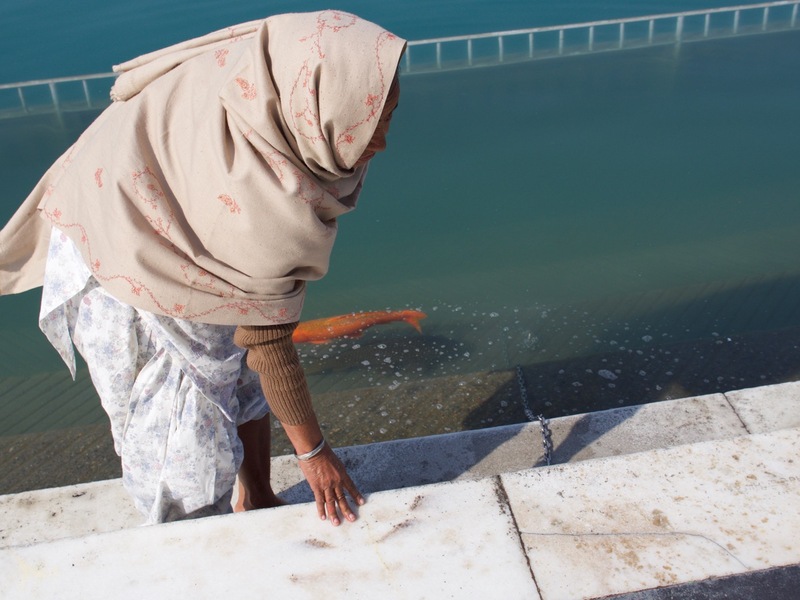 Unlike the other gurdwara we visited, the water here was heated! It felt so good to get a nice warm foot bath on the way in. 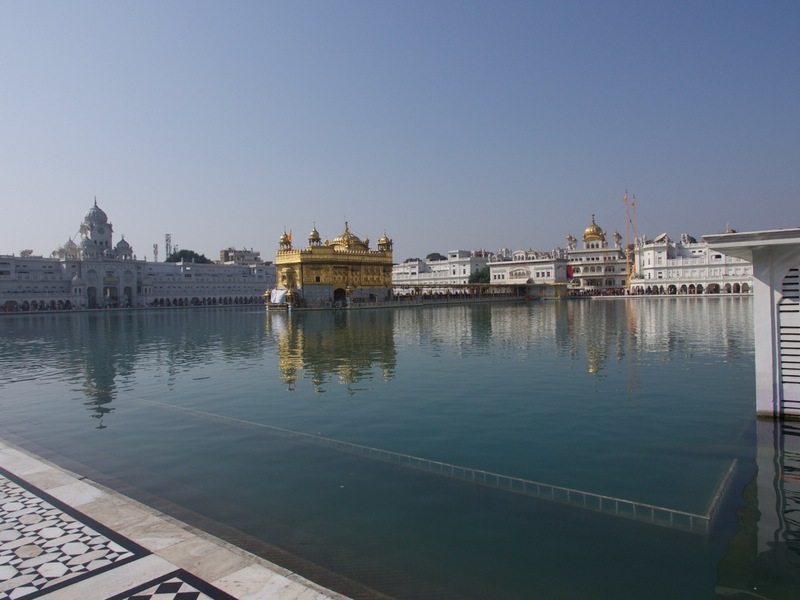 Essentially, the Golden Temple is a huge rectangular pool of water surrounded on all sides by buildings. On an island in the center of the water is a building covered with gold. This building contains the holy book, as in “the original”. And there are also people singing and playing music that is broadcast all around the complex. Observant Sikhs bathe in the pool. Men do this in open view, but women go to a special building that overhangs the pool so they can undress out of the sight of men. Women can wade anywhere, I think. 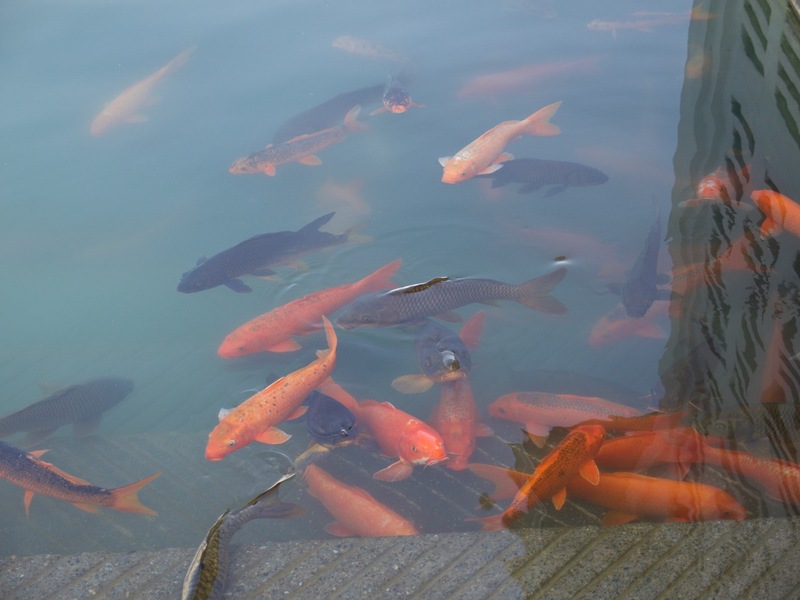 Oh, and there are big goldfish who live in the pool. Here are photos of a boy and a woman wading in the holy water. I think the difference in their attire is pretty obvious, and represents one of the many gender differences we saw in India. Men take their clothes off in public (down to their underwear, at least), and even piss in the streets in public. Women, on the other hand, must always stay modestly dressed in public view. More on this in an upcoming post. All the tourists line up to go into the golden building, where no photography is allowed. I think it took nearly an hour of standing in line to get in, and then we were only inside about five or maybe ten minutes. After walking around the entire pool and going through the golden building in the middle, we were hungry. So we left the temple, retrieved our shoes, and found our rickshaw puller. He recommended a place to eat with good food, but said that it’s farther away and it would be best to visit the other place we wanted to see first. 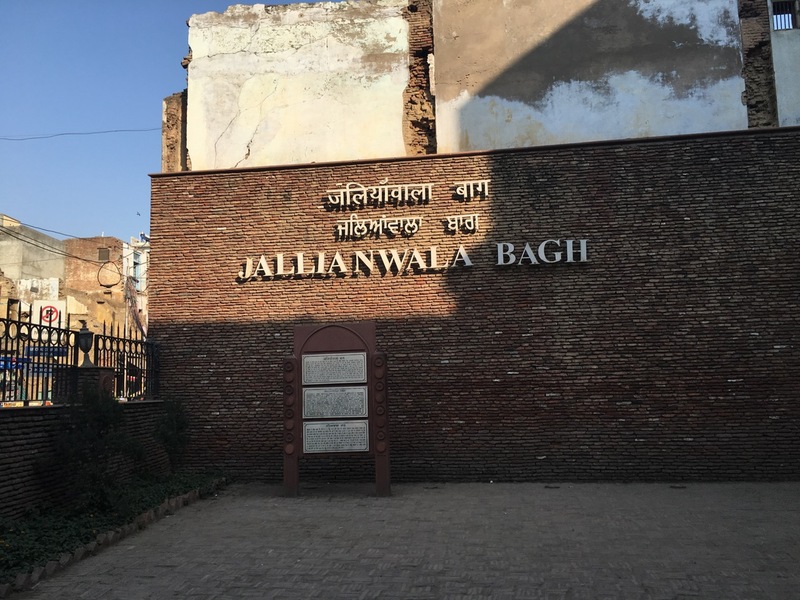 That other place was Jallianwala Bagh. So we had him take us there. This time, he went inside with us and explained a lot of stuff. 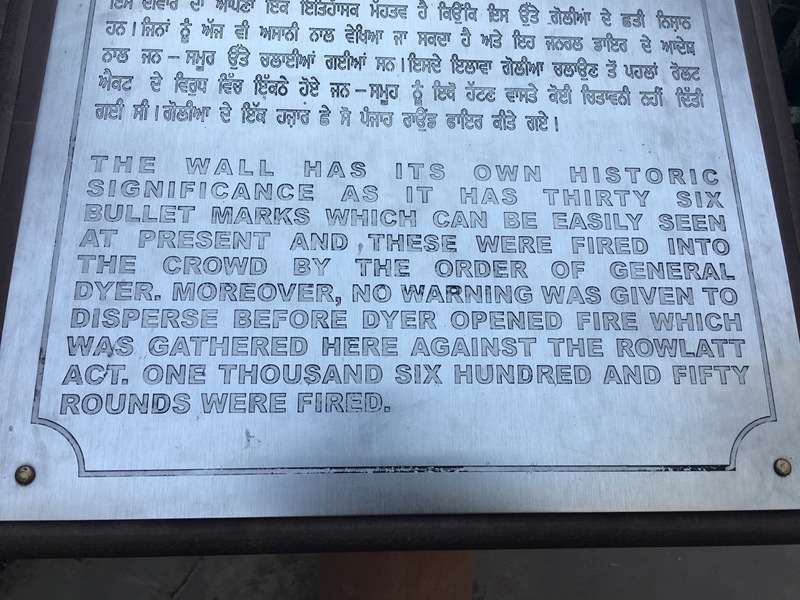 Beth had read about Jallianwala Bagh and it was on her list of places she wanted to see in Amritsar, and since it was very close to the Golden Temple in the old city part of Amritsar, we were able to easily see them on the same visit. This place doesn’t have religious significance, but historical and political significance. 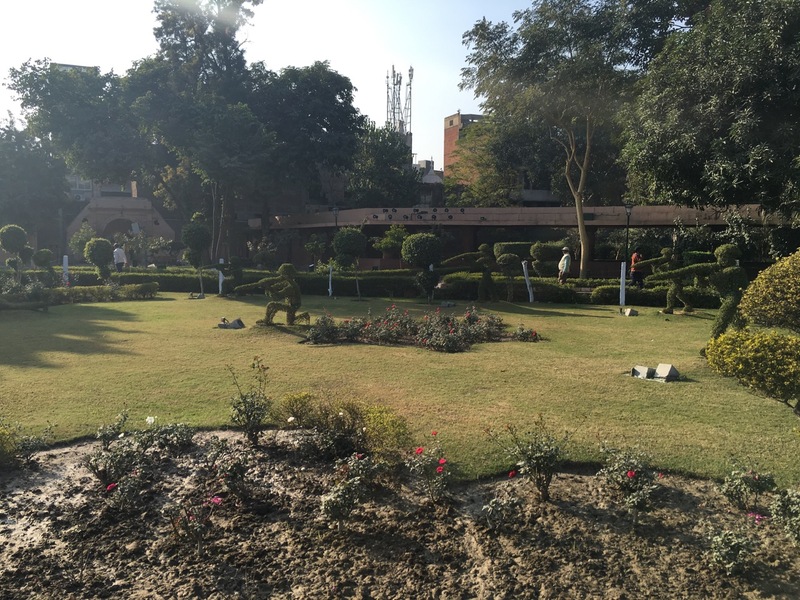 Here there was a massacre of Indian civilians by the British army, the Jallianwalla Bagh massacre of 1919. 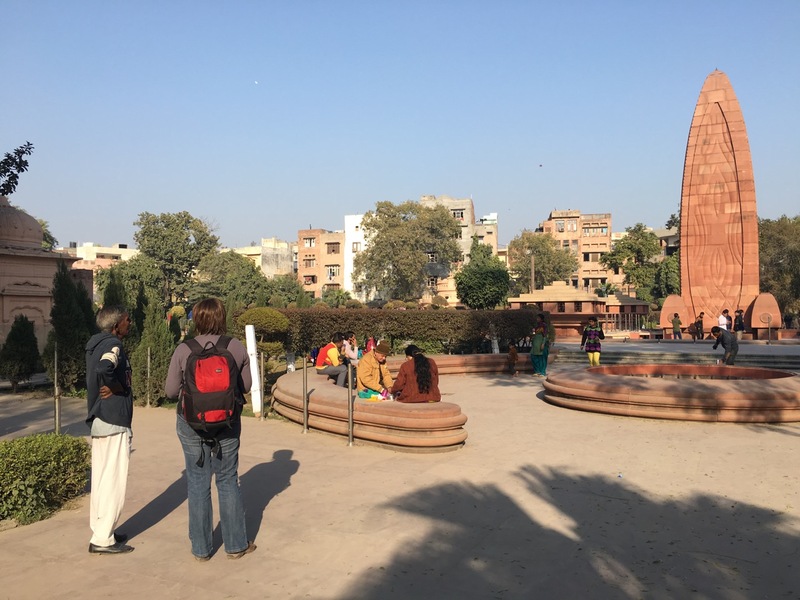 A few thousand Indians were gathered at the bagh, which was basically the equivalent of vacant lot in an American city – unused land between other buildings. It was used for gatherings and cremations. At this time in Indian history, the British were getting very worried that there might be active revolution. So when the British military commander learned about this unauthorized gathering, he sent in his army with machine guns. They marched in, set up on a hill, and proceeded to mow down the crowd, even as they were running away. 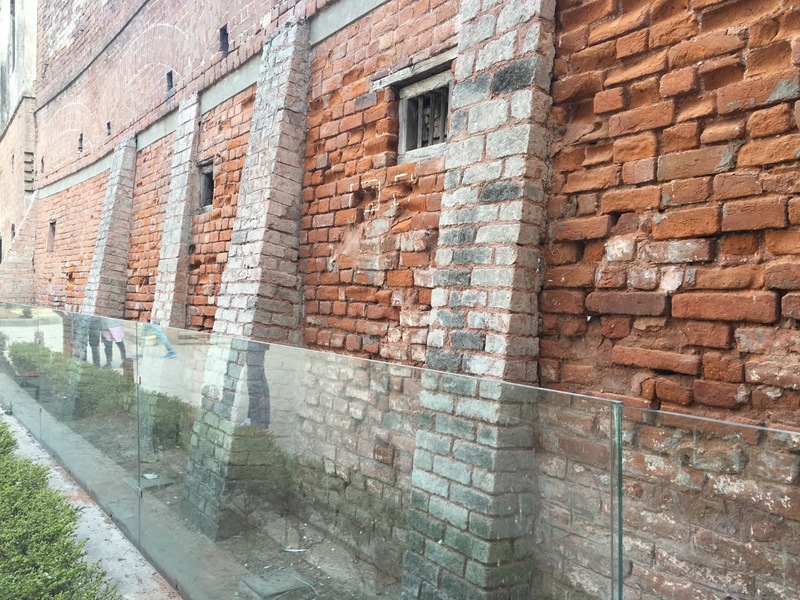 With the normal exits blocked, some Indians tried scaling the walls to get away from the slaughter, and were gunned down on the walls. Others jumped to their deaths down a very deep pit that was once a well. The British said they killed 379 protesters. Later estimates from the Indian National Congress inquiry were around 1000 dead. 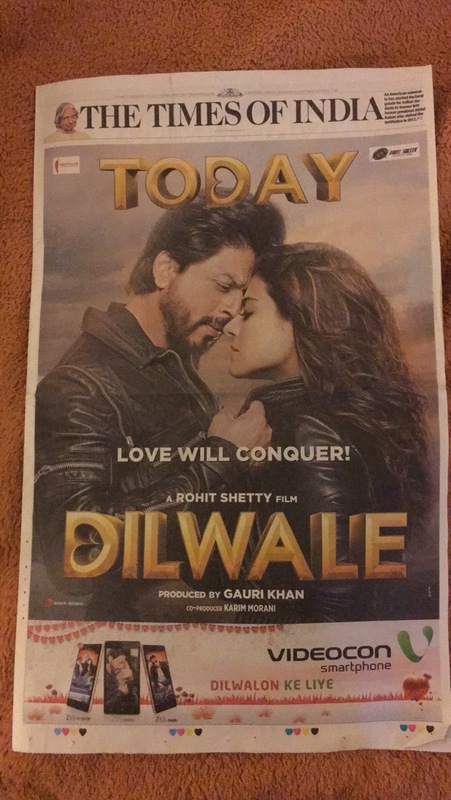 Two days after the massacre, the Indians protested. The British soldiers used guns and even bombs on the protesters, killing several more people. Later, the British leader in command was censured, and later assassinated by an Indian immigrant. The crowd was unarmed, except with bludgeons. It was not attacking anybody or anything… When fire had been opened upon it to disperse it, it tried to run away. Pinned up in a narrow place considerably smaller than Trafalgar Square, with hardly any exits, and packed together so that one bullet would drive through three or four bodies, the people ran madly this way and the other. When the fire was directed upon the centre, they ran to the sides. The fire was then directed to the sides. Many threw themselves down on the ground, the fire was then directed down on the ground. This was continued to 8 to 10 minutes, and it stopped only when the ammunition had reached the point of exhaustion. Once we finished up here, we went to a pretty good and famous dhaba for a very late lunch, and then had our rickshaw puller take us back to our hotel to rest. Beth and I had enough sightseeing and rickshaw adventure for one day. 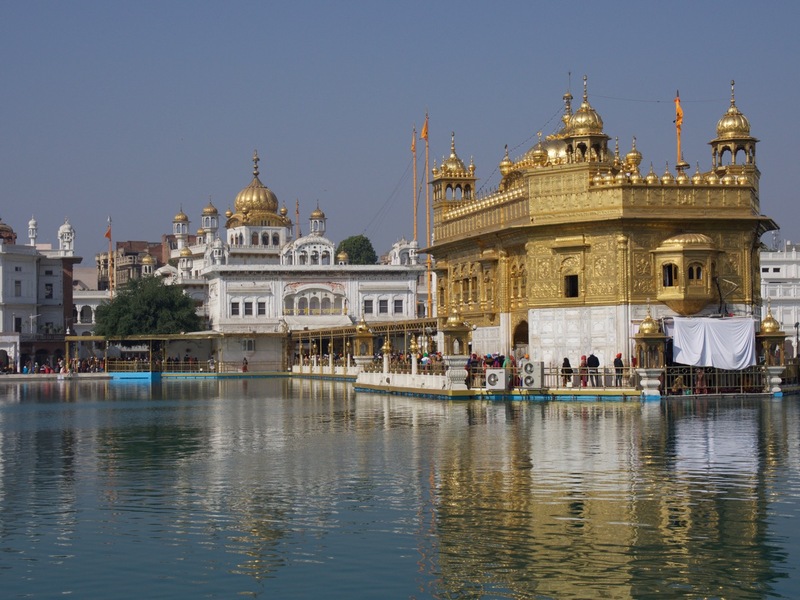 Gorgeous photos of The Golden Temple!